Continuing our “work” with the Classic Shades yarn family, today we play with Classic Shades Big Time, a bulky yarn that’s perfect for knitting fast and easy projects. 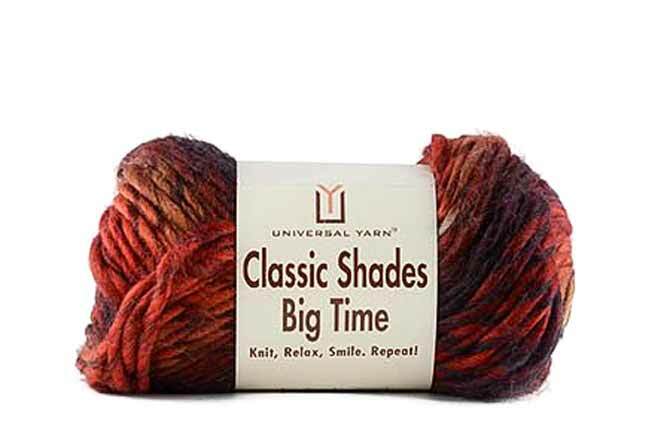 Classic Shades Big Time is a fabulously soft chunky or bulky yarn that really lends itself to making quick, affordable gifts. Although it’s not machine washable, most projects that I would make with this wouldn’t need frequent washing, so the cold hand-washing and laying out to dry would not be a chore. There are 17 colors in this heavy weight yarn from the Classic Shades family and many of them are unique to this chunky put-up. What I really like is that a few of them, like Storm Clouds and Reef, pictured below, have low contrast color pairings which make them almost look kettle dyed instead of space-dyed. The recommended needle sizes to knit Classic Shades Big Time are big, too, starting at size 11 (8mm) and going all the way up to size 50 (25mm), or even your arms. I tried swatching with size 15 (10mm) needles and 15 stitches and got the fabric in the photo below. The 15 stitches and the colorway I used (Stravinsky), made color bands that were quite wide. If you’re intrigued by the stitch pattern I’m using in this swatch, swing by tomorrow: I’ll be using this stitch pattern in the instructions to knit a cowl with just two skeins of Classic Shades Big Time yarn. I love how this yarn looks both knit up and in the skein. I did make a mistake, however, when I threw away the ball band in my haste to swatch with it and to start a project…which leads me to another comment about this yarn. The manufacturers put up the yarn in loosely wounds skeins. This is important so that the yarn feels soft and lofty to the touch when we’re browsing with our fingers in the yarn or craft store, but it does mean that the rings of yarn come off the skein quite easily once you start knitting with it. To counter this, I wound it up a little more firmly (not too tight though, because I don’t want to lose the springiness of the yarn). Then I use these cool little yarn labels by Unique. They’re flexible plastic and you can write on them with pencil or erasable marker and stick them into your hand-wrapped ball. 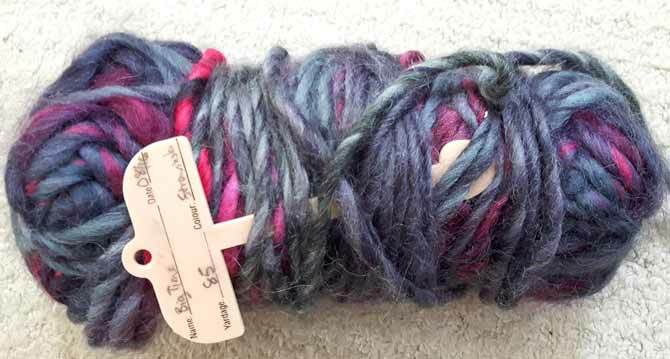 My unruly skein, now tamed and labelled. In addition to the cowl we’ll make tomorrow, there are many other quick and easy patterns to knit with Classic Shades Big Time. 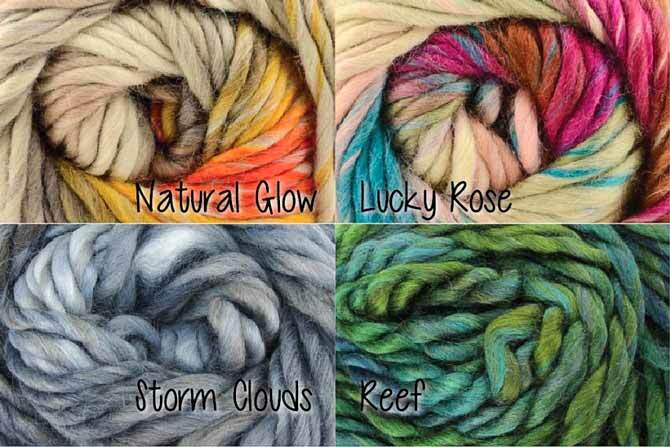 The Universal Yarn website, has 4 great patterns. The Skyscraper Shawl uses 2 skeins and wears like a classy capelet. The Cog Shawlette has an interesting assembly and also uses 2 skeins. They picture the shawlette in several different colorways on the website. The “A Little to the Left” Slouch hat only uses one skein. And the Wrapped Candies scarf uses one skein as well. Another way this yarn would be a cinch to knit up fast and easy is to finger knit it or to arm knit it. My friend Mary Beth has written books about these techniques and has some videos that cover a lot of different stitches for arm-knitting and several suggestions for finger-knitting. I hope this post has given you some ideas for fast and easy knit projects with this beautiful, colorful, bulky yarn. Tomorrow, I’ll share my cowl pattern with you. 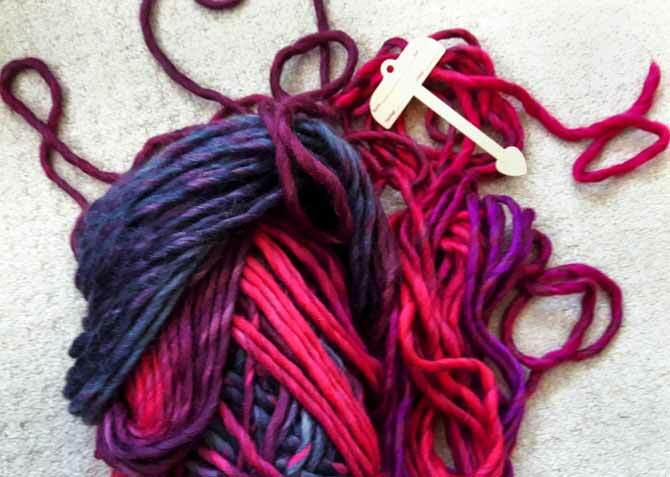 Go back to part 3: What can you knit with long-repeat multicolored yarn?